Ghost Ship warehouse after the fire. 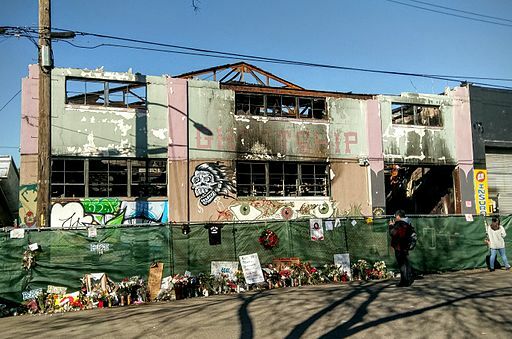 SAN FRANCISCO (CN) – Less than a week after the master tenant of the Ghost Ship warehouse that burned down last December was arrested and charged with manslaughter, his defense team accused the Alameda County district attorney of filing the charges to advance her career. Almena and Max Harris, another Ghost Ship tenant who planned the doomed December 2 party, were arrested Monday and criminally charged with 36 counts each of felony involuntary manslaughter. The criminal complaint accuses them of knowingly creating a “fire trap” by allowing individuals to live illegally in the Oakland warehouse, doing electrical work on the building without permits, and letting promoters throw music parties there without basic fire safety measures – such as lighted exit routes – in place. The Ghost Ship did not have the proper permits to be used as a residential space or an entertainment venue. Nonetheless, as many as 25 artists and musicians lived in RVs and improvised bedrooms on the building’s first floor, and 100 people attended the concert on its second floor the night it went up in flames. Asked Friday what Alameda County prosecutors thought of Serra’s accusations, DA spokeswoman Teresa Drenick reiterated what she told reporters on Monday at a news conference announcing the criminal charges: after an exhaustive investigation, they had concluded that they could get guilty verdicts for Almena and Harris. Multiple families of the fire’s victims have sued Almena, the building’s owner, Chor Ng, and a slew of other individuals and businesses in a consolidated civil lawsuit, claiming their negligence and failure to evict tenants from a space not zoned as a residence caused the deaths. Last month, the families added Pacific Gas & Electric to the growing list of 20 defendants, accusing the utility of failing to install separate electrical meters on the Ghost Ship and the buildings next to it as required by the state, and failing to monitor the dangerous flow of power to the buildings through the single meter that had been installed. Almena’s defense team also blamed PG&E Friday, telling reporters they had believed the company would be criminally charged. But PG&E spokeswoman Tamar Sarkissian denied liability in the disaster. “We’ve seen no evidence to date that would lead us to believe that our facilities were the cause of the fire,” she said in an email Friday. Some of the families have also filed claims against Oakland and Alameda County. In the months since the fire, the city has released records that show that its police, fire and building departments knew for two years that people were living in the building and holding illegal concerts and parties there, but took no action. Serra, telling reporters Friday that his client is “indigent,” implied that the families and their attorneys were litigating because of greed. “They don’t want him, they want money, ‘deep pockets,'” he said. Mary Alexander, an attorney who represents the families, could not be reached by phone for comment Friday. Despite his criticism of the civil suit, Serra said Almena should be tried in a civil court, not a criminal one. Almena could be on the hook for simple negligence, he said, but his actions do not rise to the level of gross or aggravated negligence necessary to prove criminal liability. O’Malley disagreed at a news conference Monday. “Their reckless actions were the proximate cause of the death of the 36 individuals trapped inside the warehouse when the fire started,” she said. Serra pushed back on O’Malley’s interpretation Friday. Standing beside a large photograph of Almena’s family, he reminded reporters that Almena lived in the warehouse with his partner and their three children. He said Almena would not have lived there had he believed the building was dangerous. “He loves his family,” Serra said. Almena’s partner, Allison, echoed Serra’s sentiment. “We would never have lived in a place we thought was unsafe,” she said, choking back tears as she read from a prepared statement. “They’re demonizing us,” she added. “I just hope that everyone can start having a little bit of compassion for everyone involved in what happened that night and that we can bring that into the forefront of this reality,” she said, apparently referring to the backlash the couple received after Almena went on Facebook after the fire to lament the loss of his home while making no mention of the fire’s victims. Jeffrey Krasnoff, another attorney on Almena’s defense team, said Friday that Almena didn’t yet know that people had died when he made the Facebook post. Almena’s defense team ended the news conference by implicating the Oakland Fire Department for the large number of deaths. According to both Serra and Krasnoff, the department cut a hole in the roof to reach the victims, who were on the building’s second floor, instead of entering from the side of the building. The hole caused the smoke to rise and asphyxiate them, they said. Oakland Mayor Libby Schaaf strenuously defended both O’Malley and the city’s agencies in a statement Friday. Calls to the Oakland Fire Department seeking comment Friday were not returned. Almena was arrested in Lake County in Northern California, and Harris was arrested in Los Angeles County. They will be arraigned as co-defendants back in Alameda County on June 15. Serra and Krasnoff are with Pier 5 Law Offices, and Alexander is with Mary Alexander & Associates, both in San Francisco.